(UsaToday.com) — Burger King, the No. 2 burger chain, has quietly begun testing home delivery of its burgers, fries and other sandwiches since fall at four of its restaurants in the greater Washington, D.C., area, with an eye on expanding beyond that. As nearly one-third of Americans tipping the scales at obese, the fast food giant Burger King is looking to make it that much easier to remain obese. Of course, the obesity epidemic is not the fault of fast food establishments by any stretch of the imagination. They offer a product that people can either indulge in or not. Each person is responsible for their own food choices despite the cries of some politicians (See: No Means No), so I don’t blame Burger King for the decision. If there wasn’t a market for the service, it wouldn’t exist. Disclaimer: I myself am significantly heavier than I ought to be (about 275 lbs.). I can also attribute my weight to my diet, and not some mystical glandular disorder that only affects those in denial of their actual caloric intake. My weight, like 99.99% of everyone else who is gravitationally challenged, is because I make poor decisions when it comes to what I choose to eat. I refuse to blame the fast food industry for my dietary short comings, and so should everyone else. I choose what to eat, not Burger King. But if I were to identify the innovation which contributed the most to the nation’s obesity epidemic: the advent of the debit card and its explosive wide-spread acceptance at fast food restaurants. It enabled people to access money without bank transactions any time and virtually any place. 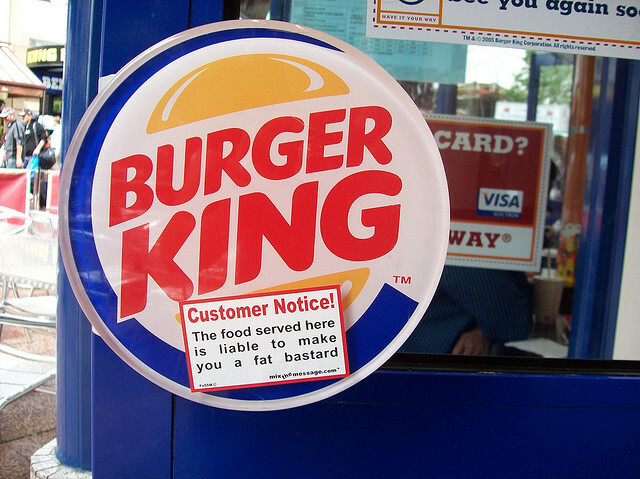 No more did people have to drive to a bank and make a withdrawal in order to partake of their Double Whopper w/cheese (1010 calories), large fries (540 calories) and large Coke (390 calories) — via nutrition-charts.com. That’s 1940 calories with a single swipe of a debit card. It has become very easy to make purchases of this kind. No longer does anyone need to wrestle with the decision of whether it is worth the drive to the bank to make an impulse burger purchase. Couple this with the anti-obesity stigmatization movement, this is was a recipe for disaster. We don’t want to hurt their feelings, we don’t want them to feel self-conscious about their weight. I think this is a mistake. People should be embarrassed about being as big as some are. But they need to be embarrassed without excuses. The victim mentality has been programmed into the last generation and a half — someone did this to you, someone allowed this to happen to you. The smoker is a victim of Big Tobacco, and the obese are victims of Big Fast Food. This victimization has come at the expense of personal responsibility — precisely the problem. Local and state governments only solidify this notion of victimhood when it legislates against the industry. I only see this service as yet another enablement. While I don’t view this new service as a greedy corporation preying on the weak and helpless, making its profits on the backs — or bellies, as it were — of an unwitting public. People know what they are consuming is not good for their health. Like cigarettes, no one is under the impression that smoking is medically benign. And no one thinks eating a Whopper is as good for you as eating a salad. It really is unfortunate that there is actually a market for a fast food delivery service. The whole nanny-state idea pisses me off. It’s why I cannot stand – despise, in fact – Michael Bloomberg. I chew tabacco, ya know.Copenhagen Wintergreen. And do you why? I LIKE IT. I was not forced to start chewing by some evil, greedy company. The nicotine they in it is addictive, but I knew that when I started (unlike people years ago). I quit for over a year once but started back up because I generally enjoy it. Nobody forced me. When I was in the Army we had fast-food delivery in the form of a “Hoagie wagon” that came through the company areas weekday evenings (well after mess hall hours) and a couple times during the day on weekends. Since most of the guys back then didn’t have cars to drive into town for fast food (those who did would often make “you buy, I’ll fly” runs) and the PX snack bar hours weren’t always when you needed them, the delivery of fast food to the area was a great boon! It wasn’t on-call, but everyone knew the schedule. This is where I see proper use of home delivery of fast-food. Today home delivery of BK type of food has to be from abject laziness! Burger King delivery? Whoa, crazyness! I worked at BK for 13 months over a year ago, I cannot imagine doing delivers during lunch or even dinner rushes. Could get confusing I’d well imagine. But on another note, I agree. Can’t blame BK for one being fat/obese. Can’t blame anyone but yourself as each individual has to properly care for his or her body. This is, of course, just keeping up with perceived competition from pizza joints and sandwich places like Jimmy Johns (if you have that near you). It’s a convenience sure to be abused by the lazy, or, utilized by the lazy when it makes sense to do so. For myself, I would love to have some place offer Beef Wellington delivery, or prime rib with double-baked potatoes and a bottle of cabernet. By the way, I am between 210-215, down from a high of 242 and have maintained for about a year. I’d like to see what 200lbs looks like on me. I love fine dining. Good thing I can’t afford it too often. I wouldn’t really blame it on debit, though. $1-2 cash is a pretty easy impulse buy, and probably wouldn’t send anyone running to the bank. Deliveries in and of themselves aren’t the hugest problem either. I mean, greasy pizza and greasy Chinese food have been delivered for quite a while, and the only difference between those and Burger King is that they’re slightly more expensive and actually taste good. No one is forcing you to get delivery just because it’s there. I mean, I’ll voluntarily walk up and down a nearly vertical slope to go to a restaurant that delivers. I’d say anyone that doesn’t is missing out and fairly lazy, but that doesn’t mean delivery should be illegal. The government policies have nothing to do with obesity. People have been obese forever. Obesity is caused primarily by overeating and lack of exercise. You can overeat the most healthy food in the world and get obese. The primary cause of obesity is laziness and no self-control. THe nation’s kids are getting fat because they eat all the time and sit in front of their computers. It is hard to find kids outside playing any more. Don’t blame the government or even the liberals for people getting fat. You are completely misunderstanding the problem. People should not be judged by the size of their bodies, because you cannot know why their bodies are the way they are just by looking at them, nor can you judge their health or habits by body size. I will not be embarressed about the size and shape of my body just because other people don’t like it. You are also making significant assumptions about why people are fat. It has nothing to do with junk food. It’s not sugar. It’s not fat. Just look at some historical recipes and menus to see the incredible amounts of fat, salt, sugar (or honey, depeding on how far back you go), meat and just plain calories people ate. They didn’t necessarily get more exercise than we do today, either (if anything, the ones who worked the hardest were also the ones too poor to eat much at all). Just as examples, my parents are both fat, as is my aunt. So was my grandmother and my great-aunts. They all outlived their thin relatives, spouses, friends and even their children. They have also all been farmers who never ate junk food (it didn’t exist). They grew almost all their own food, and being Polish, it was heavy on meat and fat. I grew up on a farm, surrounded by farmers, who also grew most of their own food, and most of them were fat, healthy and long lived, too. I would recommend spending some time at this blog. http://junkfoodscience.blogspot.com/ Most of what we’re told about obesity is a complete myth (even the definition of obesity is problematic), as are the supposed dangers associated with being big. It’s not being big that’s dangerous. It’s the stuff we do to ourselves to try and turn our bodies into something their not that kills us. For the instances that are unusual (and they are no where near as common as portrayed), again, there are many other factors that could be involved. People assume fat kids are fat because they sit around all day shoving junk food down their throats – something which, if you spend time going through the link I gave you above, you’ll see has been found not to be true. The diet and exercise levels of fat kids is pretty much the same as thin kids, but the thin kids are magically considered healthy by virtue of their body size. In fact, there is far more of a problem of children as young as 6 being hospitalized for anorexia and other eating disorders. We now live in a culture obsessed with thinness, and pregnant mothers are being told not only to NOT gain weight while pregnant, some are told to go on diets (shades of the Victorian era “perfect parasite” redux). This despite evidence that calorie restriction during pregnancy (which in the past usually involved starvation due to war or famine) results in children who gain unusual amounts of weight that cannot be explained by heredity (the number 1 predictor of body size), and also develop many health problems as they grow older. Another possibility is the emergance of soy as a “health food,” even though it’s known to damage the thyroid, pituitary and pancreas, as well as cause damage to sexual development in children, including in utero if the mother eats a lot of soy. There could be other possible causes as well, but as long as we all assume that fat people are fat because they’re just too stupid and lazy to eat “properly” (whatever the health fad happens to be at the moment), we’re not going to find out why unnatural weight gain in any individual occurs. These assumptions are killing thin people as well, since illnesses that result in weight loss get missed because everyone it too busy patting their backs for doing such a great job of getting thin. Then they wonder how someone who was “so healthy” could suddenly drop dead of undiagnosed heart diseases, cancers, and so on. It has been proven over and over that the more people become obsessed with dieting and thinness, the fatter they become in the long run and the worse their health ends up. People who have never dieted*, regardless of what their body size is, do not display any of the indicators for health problems attributed to obesity. Worse, because of our cultural abhorance of fat and fat people, real health problems are being misdiagnosed, ignored or worse, even to the point of killing people. http://fathealth.wordpress.com/ has many such examples. *note: here I refer to dieting as the restriction of food/calories for the purpose of weight loss and do not include dietary changes for specific health issues, such as dairy, soy or gluten intolerances, allergies, Crohn’s Disease, IBS, etc. Sorry for the novella, but this is an issue I’ve spend significant time looking into, and have been appalled at the poor science and deliberate misinformation out there. People should not be made to feel good about being obese. Like I said aside from the. 00001% who might actually have an actual condition that makes them heavy, people are fat because of their eating habits and sedentary lifestyle. Your comment is exactly what I was decrying. People who want to make people feel OK about their problems when the loving thing to do would be to tell them to stop eating so much, and so much of the wrong things. Tell them to get some exercise. Is it loving to make lifelong smokers feel good about their lung cancer or emphysema? Is it loving to look the other way as they chain smoke 2 packs a day? No. If you loved a smoker you’d tell them to quit. If you love a fat person, tell them to quit. Put down the burger. Remind them that the lettuce and tomato on that burger does not constitute a salad. I basically agree with everything that has been said. People are lazy, kids are more interested in playing on the computer or the XBOX, etc… But we must also consider that obesity is higher among those stricken with poverty, because cheaper foods, generally, are not very good for you. The cheaper foods poor people generally buy are carbohydrate redundancies. I know this because I was pretty damn poor at one time. I grew up eating buttered noodles at least five times a week. There are ways to cook healthier food on the cheap, I’ll agree. That’s why I support some sort of mandatory nutrition classes for people on food stamps. I remember back when I worked as an EMT, I saw plenty of overweight children that were, believe it or not, malnourished because they weren’t being fed the right stuff. They were being fed fattening junk that didn’t contain much in the way of nutrients. Fast food isn’t actually cheaper. For what you spend on a “value meal” you could get at the grocery store enough to make multiple times the amount of food. Not even the dollar manure fare better, to order say, 3 things off the menus, you could still get more. The difference is lack of motivation to cook it yourself. It takes time and effort. Everything about the fast food industry exploits the human being’s laziness. And I speak as a guilty party. I love fast food, its easy to obtain, its ready right now, and (depending on which chain you go to) it tastes good. Cooking at home means going to the grocery store, walking the super market, waiting in line, driving home, prepping the food, plating it, eating it, and cleaning up afterwards — dishes, counters, etc. Its all about bad choices from beginning to end. I’m not talking about fast food. I was responding to the discussion as to the reason for obesity. The cheaper foods in the grocery store (e.g. mac & cheese, hot dogs, hamburg, etc…) are just as bad for you as fast food. The people who do have the motivation to cook – and I agree that many people do not – probably don’t know how to cook healthy food on a low budget. These are all examples of what I was talking about, because every one of these statements are FALSE and cause more damage than not (and if you’d spent some time at that first link I added, you would have seen the evidence for that. I can include more links and recommend books, but seeing as how you’ve all apparently got it figured out, I don’t think any of you are open minded enough to actually read them). What such statements do become is self-fulfilling prophecies, as people who repeatedly fail to reshape their bodies to conform to unrealistic cultural demands finally just give up become what everyone assumes they are anyhow. What good is living a healthy lifestyle when everyone around you thinks you’re lying and demonizes you because, after all, if you *really* did do all those things, you’d be thin, right? Never mind all those people who are thin while doing all the “wrong” things – that’s just their “lucky” genetics. I am all for nutritional education. I’m all for knowing how to cook, and cook well on a budget. I’m all for the health benefits of getting adequate exercise. But guess what? If everyone did this, you would still have lots of fat people! As for those who actually are unnaturally fat, as long as they are being judged like this, any *real* causes (such as those I mentioned earlier, plus many more possibilities) will be missed, and the dieting and weight loss industry will continue killing people and destroying their health. When people are putting their *babies* on diets, when toddlers and pre-schoolers are starving themselves because they think they’re fat, when teenagers are taking up smoking and doing drugs to avoid becoming fat, when people surgically mutilate perfectly healthy digestive systems and destroy their bodies in their quest for thinness, and refuse to take necessary medication because the side affects include weight gain, it is NOT fat people who are the ones who are the problem. The problem is a culture of body dismorphia that tells us we are only worthy if we look a certain way. I was 265 pounds about 15 years ago, the result of 5+ cans of soda per day and not being conscious of what I put in my mouth. Since then, my weight has fluctuated between 195 and 230 pounds- depending on my will to keep my weight in check. Surprisingly, it seems that the more I pay attention to my diet and the more I exercise, the closer I stay to my healthy weight under 200 pounds. Go figure. I don’t agree with you though, John, about the causes of increased obesity. It certainly has little to do with debit cards or their acceptance at fast food chains. Canada has had debit cards for about ten years longer than America, and they were better accepted by retailers here than on your side of the border. We also have a lower obesity rate. I’m no expert, and this is purely conjecture on my part, but I think the increase in obesity is linked to longer work hours, more two-income households, longer commutes to work from the suburbs, and the increase in technology that has made processed foods quicker, cheaper, and less nutritious. My feeling is that fast food (and this includes chips and other junk food) appeals to a culture that does not have time to cook for themselves or their family. This may be a true lack of time or a perceived lack of time- and personal responsibility is ultimately the issue here. The American and Canadian culture, and similar as they are are starkly different. Just look at crime rates. So there is an American “I want lots and I want it now” attitude that I don’t see to the same degree in Canadians. So Canada having debit cards may not produce the same result. But I know from experience, from myself, and from other gargantuan family members and friends. I see what I and they eat, I see how much exercise we get, I see the repulsion to healthy foods and attraction to unhealthy ones. In fact when I posted this on FB, one of my cousins all but drooled over the prospect of having fast food delivery. I had to remind him of the play on his name I invented for him precisely because of his eating habits. He invents new menu items. The “McChurger” is a Frankenstein of fast food sandwiches. Geez, I know of that which I speak on this one. I have no idea where you live, but I’ve lived in a number of cities and all of them had restaurants willing to deliver such meals (though not the bottle of caberanet, for legal reasons). When my first daughter was born, my husband was off at sea and I was on my on struggling to care for a baby with problems I’d never had to deal with before, and with no support. I spent so much time taking care of my baby, I didn’t really take care of myself. Once in a while, I would break down and order in. A local restaurant not only would deliver such meals, they would even cut my ribs apart for me when I explained that I could only eat with one hand (over the sounds of a screaming baby). As an aside, I’ve got a family with 3 people who are lactose intolerant, 2 that are soy intolerant and one that is also gluten intolerant. (Next time you’re at the grocery store, just try and see how many prepared foods there are that have none of those) I’m the only one that isn’t any of those things, but greasy food makes me sick, so fast food is a rarity in our household. It’s basically fresh meats, fruits and veggies, with grains for those who can eat them. I am inclined to attribute kids with lots of “intolerances ” to lack of exposure. Just like parents who feel a need to disinfect everything and won’t let the kids play with anything “dirty” are often more sickly and are more affected by the illness because of a weak immune system. Likewise parents who keep kids from all “unhealthy” foods tend to see intolerances. I have seen it with vegan parents keeping milk and fats which kids need to actually be healthy end up with digestive disorders. Not that I know what your parental feeding schedule was, just that I have seen it with more than one example. I tend to agree with that statement, though my own children disprove it. It may be true for others. I see nothing healthy about raising kids in a sterile environment. My own kids had plenty of opportunity to eat their peck of dirt, yet they both have intolerances. They have allergies, too, but we don’t know what exactly they’re allergic to (something environmental and in my home town is all we can say for sure). My own family has no history of intolerances and the only allergy that’s ever showed up is in my dad’s allergic reaction to a specific sap that he would be exposed to when milking cows in the spring. My husband’s family has a history of diabetes and thyroid problems, but no intolerances and few odd allergies, like ampicillin, which is given to people who are allergic to penicillin. So how did I get kids who are lactose intolerant (my husband developed that well into adulthood) and one that’s glucose intolerant? No one’s been able to figure that out yet. That really is too bad, Kunoichi. I can’t imagine having food alergies or intolerances. Luckily no one in my family has any alergies or intolerances. It must be especially hard on children. And I admit I probably take it for granted. I haven’t studied the others, but lactose intolerance isn’t lack of exposure, it’s a well documented lack of a gene. Most mammals become lactose intolerant soon after being weened. Human’s are very unique in this respect. I believe it is not the lack of a gene, but the addition. Either way. Not many 3rd world starving people with intolerances or alergies. Allergies, though, I’d agree with, there’s something wrong with our diet or environment. Not a lack of exposure to wheat and soy; as Americans, it’s pretty damn impossible to avoid exposure to those. Lactose intolerance isn’t too hard to live with by itself; lactaid is a wonderful product if one just can’t resist indulging in some yogurt or cheese! ;-) There are a lot of lactose free products, though. The source of the milk makes a difference, too. A lot of people who can’t do cow’s milk can ingest goat’s milk without trouble. I don’t know about reindeer, mare, buffalo or some of the other milks people drink, but cow’s milk is supposed to be the hardest for human’s to digest, while goat is apparently the closest to human milk. A milk allergy is a whole different animal. The allergy is to the whey protein, and it shows up in all sorts of unexpected places. Lactose free products often still have whey protein in them. Even deli meats can have it. With soy, everyone is intolerant of soy. It takes a lot of processing to make soy digestible and remove the toxins that cause such abdominal distress. Modern heat processing in inconsistant. The old methods of fermentation (which can take years) do it, though. Soy is still high in phytoestrogens, which are almost identical to human estrogens, so it should be avoided by men (affects testosterone and reduces libido), pre-pubescent children (can cause early menstruation in girls, breast development and weight gain in boys) and pregnant women (can lead to abnormal development of sexual organs in the developing fetus). Being highly subsidized, it’s very cheap, so it’s everywhere. The oil is used a lot, even though it goes rancid quickly compared to other oils. It’s also used as filler, etc. Anything that says “vegetable oil” or “vegetable protein” is likely to be at least part soy. I’m not sure what to make of gluten intolerance. I’ve heard of a possible thyroid connection, and thyroid problems are believed to be massively underdiagnosed; you can have a malfunctioning thyroid, with all the symptoms, long, long before a problem shows up in blood tests. Humans have been eating various glutinous grains for thousands of years. It’s possible there has always been people who are gluten intolerant, but no one recognised it for what it was.